With so many types of air conditioning system on the market, we often get asked what factors people should consider when choosing what to install. There are a range of options available with varying running costs and efficiency levels. As cooling and heating your home or business can use a significant amount of energy, it’s worth giving some consideration to your requirements up-front to help save you money in the long run and ensure the solution you choose suits your longer term needs. The climate in Brisbane: do you need heating as well as cooling? Once you’ve considered these factors you can then go on to look at the types of system available and which might fit your criteria. What’s the difference between a split system and ducted air conditioning system? Most air conditioning systems nowadays have reverse-cycle technology. This means that they can both cool and heat a space. 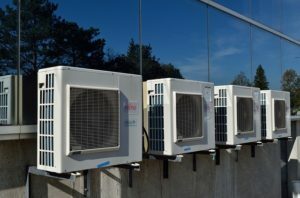 Deciding between the various types of air conditioning system is largely determined by how many rooms in the building you will want to control the temperature in. If, for example, you were looking to manage the temperature in the whole building, a ducted air conditioning system would probably best suit your needs. This means that a central unit is installed, usually in the roofspace, and a series of ducts run from the sir conditioning unit to each room. However, if you just wanted to control the temperature in a single room, a split system air conditioning unit would suffice. Split system simply means that it consists of two main parts: an indoor unit, known as the fancoil, that blows the cool or warm air into the room and an outdoor unit, that has a compressor and condenser, that dispels the heat from the room. Unified Electrical can supply and install both split and ducted air conditioning systems. If you’re looking for air conditioning installation Brisbane, don’t suffer through the summer heat, give us a call today and we can have you cool again in no time.